Funeral of a Militiaman. The streets of the Town were lined with large and sympathetic crowds on Saturday afternoon when the mortal remains of the late Mr Edward Hocquard Syvret, a Private in the Town Battalion who passed away on Wednesday last aged 19 years and 6 months as the result of a chill contracted whilst on out-post duty, were laid to rest. The cortege left the residence of the deceased's parents in Greve d'Azette at 3 o'clock for St Helier Parish Church where the first portion of the burial service was impressively conducted by the Very Reverend The Dean. The procession made up of the Firing Party of the Town Battalion, the Militia Brigade Band and the buglers of the Town Battalion followed the glass hearse containing the coffin, which was covered with the Union Jack on which rested the deceased's hat and sidearm together with several beautiful floral tributes, a number of these were also placed on top of the hearse, the rear of the cortege was brought up by a party of NCOs and men from the Town Battalion. 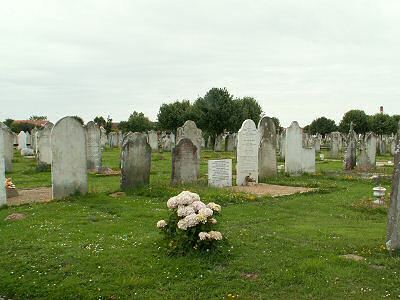 Several of the past and present pupils of the West End School, of which scholastic establishment the deceased was a former pupil, lined the pathway of the churchyard and the cortege passed through their ranks into the church. At the conclusion of the service at the Parish Church the cortege reformed and wended its way to Mont a l'Abbe cemetery where the interment took place. The obsequies here, needless to say, were very impressive, the usual Military Honours being accorded. Son of Edward & Alice Elvina (nee Le Boutillier) of 2 Lurline, Greve d'Azette, Jersey. Died of influenza/meningitis at the home of his parents, aged 19 years.